This post is a reflection on my strategies for communication and professional responsibilities (Domain 6) for the American School Foundation of Monterrey Track 1 project. I consistently follow school procedures, supervise students appropriately and maintain discretion with sensitive information. I maintain accurate information on student progress, gather sufficient evidence and meet deadlines without reminding. I volunteer to participate in school events, actively help create a positive culture, and provide support to and seek it from colleagues. I assume some responsibility for school improvement and keep an open mind. I collect and analyse data with increasing consistency, and work within some collaborative structures to exchange ideas. I have a generally accurate impression of a lessons effectiveness and make specific suggestions to modify instruction; I use feedback to improve my practices. I seek out professional development opportunities and participate actively in my team and department. I use a variety of technology appropriately and competently, and am beginning to use this to improve my instruction. The reflection questions for the domain of communication and professional responsibilities are varied but can be categorized into three topics: demonstrating professionalism, contributing to the school, and developing as a professional. I believe that I meet the ASFM standards in all three areas. The first are under this domain is demonstrating professionalism. This means all number of things, but the basics are simple: I am always on time to school and usually early, I present myself well, I meet deadlines and carry out school-assigned duties to the best of my ability, I treat all students, colleagues and parents with respect, I work well with my grade-level team and the Math department, and I seek out help from colleagues when needed. One important aspect of professionalism in a school is supporting and implementing school procedures. I find that the best way as a teacher to do this is to first understand the procedures and the reasons for them, and when relevant to communicate and explain the procedures to students. For example, the school’s policy on assignments not handed in (NHI) is designed to be a balance between the need to have deadlines and the understanding that students can have complications in their lives, and that learning is a process that does not stop at a deadline. At the beginning of the year, I explained this to my students and explained my implementation of the policy. I also support school procedures and try to understand the reasons even when I disagree with parts of the policy–for example, the exam exemption policy which I suspect causes more problems than it solves. Luckily, there have not been too many of these cases this year! 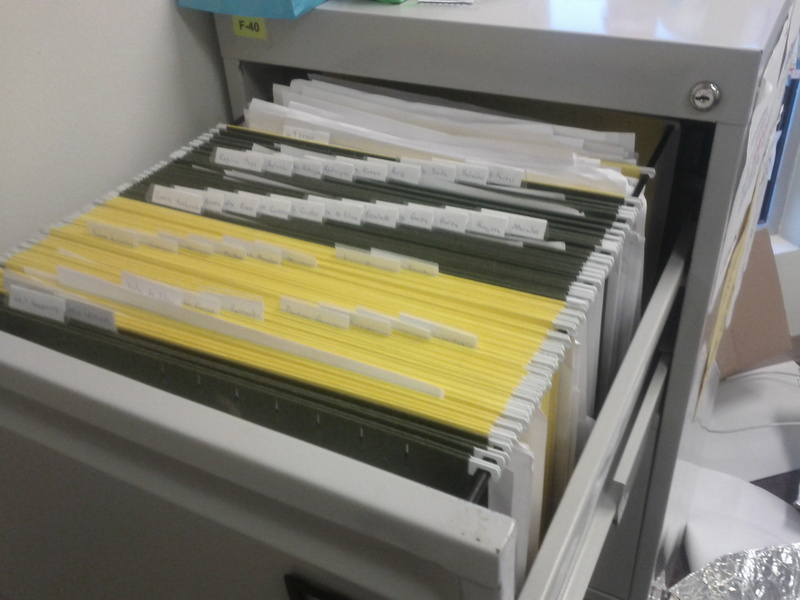 I also keep accurate and timely records, both online through PowerSchool Gradebook and in my real-life filing cabinet (to right). After I hand back an assessment, students store it in their personal file in my filing cabinet so that it is accessible for my records and their studying use. Since math assignments and tests do not involve slogging through endless written essays, I have made it my goal to get all assignments and tests graded and back to students within a week of their completion, and have succeeded with one or two exceptions. This way, my students get feedback promptly through my corrections, comments, rubric evaluations, and PowerSchool grades. In giving students prompt feedback I am following the Math Department manual as well as pedagogical common sense. It is important to be perceived as a professional by the school community, which in the case of ASFM is largely Spanish-speaking, Catholic Mexican. While I purposefully limit my involvement in the school community–for example, by avoiding socializing in places my students and families are likely to go–I have made links with the Parent-Teacher association through my wonderful host family, and I have no problem in sharing my genuine interest in Mexican culture and the Spanish language. Aprendo como hablar español… es divertido! It is also key for modern professionals to be competent users is the technology of their jobs, and I am very comfortable in this regard. I am a competent user of most technology tools and often go beyond use to creating and maintaining technical systems; for example, I am the webmaster for the Canadian Student Debating Federation and run my own webpage which you are reading now. 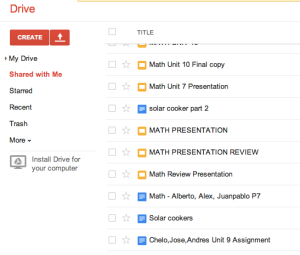 In the classroom, I use Google Drive (below) to share documents back and forth with students, which has been most useful to facilitate handing in projects such as their review presentations. I also use efficiency and organizational tools such as Google Calendar to stay organized. I have also made myself available to my colleagues as a reference for technology use, for instance helping Elizabeth, a fellow teacher, replicate a formula down the column of an Excel spreadsheet. The second area of reflection in Domain 6 is contribution to the school. I feel that even as a first year teacher I have contributed positively to the school culture. I make a point of attending varied school events, from arts events such as the school musical, the plays at DramaFest, the concert at ArtsWeek, to sports events such as the Grade 9 ASOMEX soccer tournament, to other activities such as the presentation on relationships that was offered to the Grade 9 generation earlier in the year. 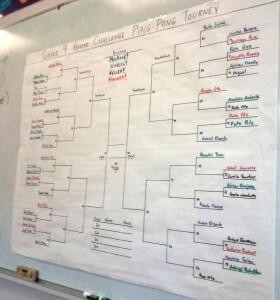 I participate in activities such as the Voices concert to fundraise for the MUN club and the school’s board game club, of which I am the departing Settlers of Catan champion. I also contribute to a positive teacher culture by participating in sports activities such as ultimate frisbee, volleyball, rock climbing and hockey with other teachers. I also contribute to school initiatives, though being new to the school I anticipate my contribution here will grow in the next few years. One of my contributions this year was through the Grade 9 team as a House Leader. 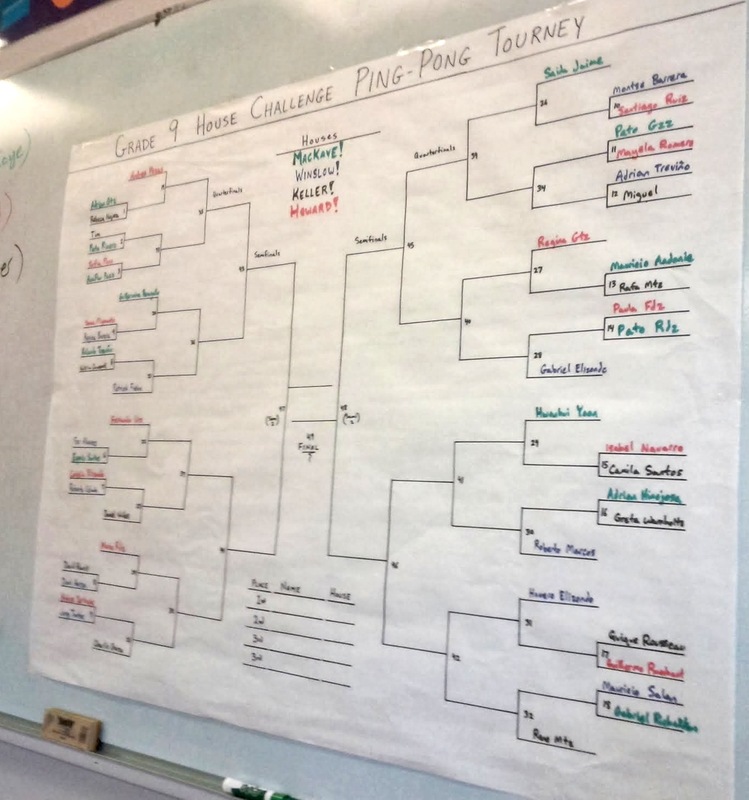 I worked with three other house leaders on the team and two other conference leaders in my house to run activities such as the Quiz Bowl, the House ping-pong tournament (below) and the culminating Crested Caracara Cup. I have also worked with my department team on initiatives related to data analysis, using MAP tests and diagnostic exams to improve our understanding of our students and improve instruction. One initiative I supported earlier this year was the new debate club, a Grade 9 student initiative. Working with Ms. Mila to support the students was a good learning experience, and the failure of the club was instructive to myself as a potential sponsor going ahead. I am thinking about re-visiting a debate club next year if there is support from admin; however, I would make a few changes. I would restructure the club as a team, with myself as a coach rather than supervisor; I would look for students who were committed to the team; and I would have the goal of attending a international debate competition by the end of its first year. The third and final area of reflection for this domain is professional development, both through external development and self-reflection. My first year has been an intense development experience, guided by the structure of the Track 1 development process and supplemented by department development opportunities such as the data work mentioned above and full-team development work. I also had the great opportunity to work closely with our Instructional Coach, Melanie, who helped me develop a classroom management improvement plan going into the second semester. I have not been involved in external professional development opportunities but will be looking into conferences or courses starting next year. I also take the opportunity for self-reflection, both on a daily basis and taking a broader view. Since I teach three Math 9 courses and two Pre-Calculus 11 courses, I have the opportunity to revise the way I instruct a lesson during the cycle of teaching it. I will often make small tweaks based on observations from teaching a lesson the first time, as discussed in my Instruction reflection. I also reflect by posting on this blog; whether a quick post with a few photos of student work or a longer piece such as this one, I gain the benefit of writing down my thoughts about my instruction and assessment, which I can return to and reflect on later. The Track 1 project has also been a useful framework for self-reflection and self-assessment at the end of my first year. In sum, I contribute to the school well as a professional member of the ASFM community, and I will develop further in my skills as a teacher in the years ahead. I am helped in this by my previous professional positions; while I am technically a new teacher I have various full-time and temporary educational experiences to draw on in maintaining professional comportment. I also genuinely enjoy being involved in the school and its activities, especially seeing my students participating in a chosen activity out of the classroom.